Pagico - One app for all your notes, tasks and projects. For Mac, Windows, Ubuntu, iOS and Android. Have all your tasks, files & notes under control. For Mac, Windows, Ubuntu, iOS & Android. Projects, clients, notes, files, tasks. Easily browse all your data, or archive old stuff to reduce clutter. Lists are cumbersome to look at. How about getting the big picture instantly by glancing at your flowchart instead? 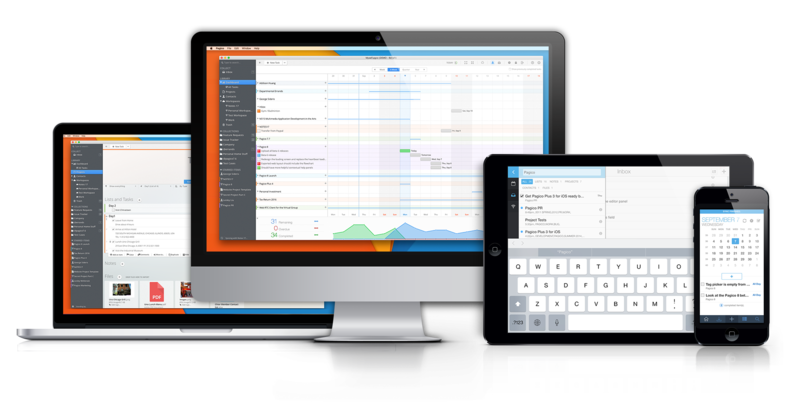 Pagico is available for Mac, Windows, Ubuntu, iOS and Android. And it has built-in cloud sync feature to sync your data. Pagico turns all your tasks into interactive flowcharts. When you can see all your on-going projects in one view like this, there will be no more (unpleasant) surprises. Enjoy a Bird's eye view of all your on-going projects, and feel good about your progress. Manage your day & stay focused. 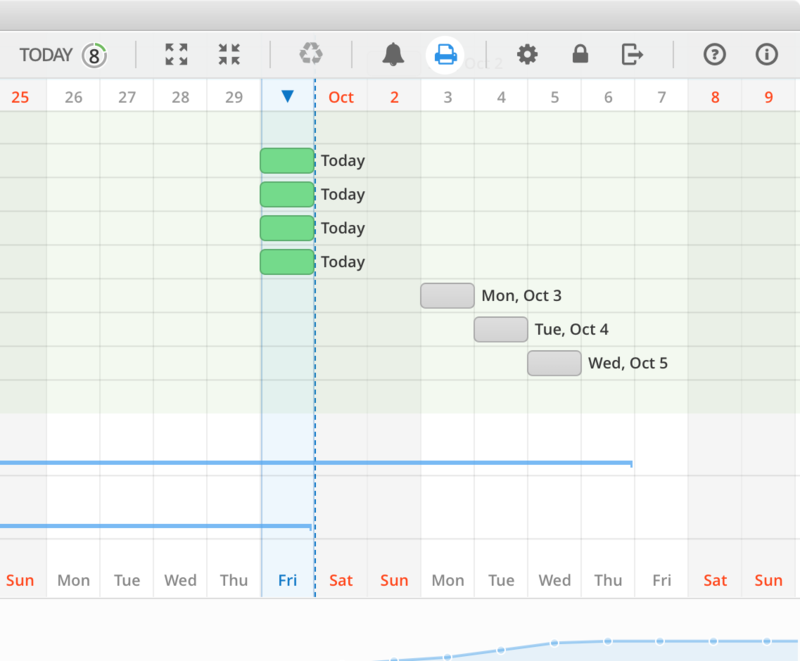 With the new Today view, you can see everything scheduled for today, and things that are late with minimum friction. You can also prioritize and reschedule your tasks by simply drag-and-drop. Plan early and review often, and you will stay on track. ... and you'll have a tremendous increase in productivity. You can have your vacation itineraries stored right next to restaurant menus, and action items right on top of meeting notes. 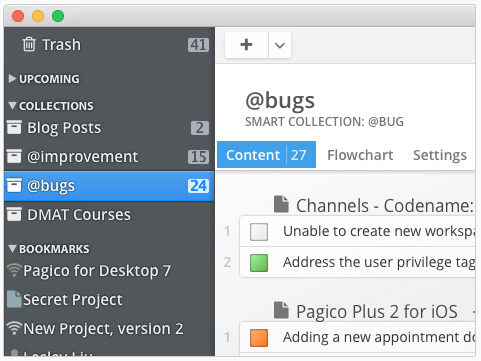 You can keep all your projects in your Pagico database and have them neatly organized. With our uniquely designed tag browser, navigating in your project library is easy and awesomely satisfying. Our tag browser lets you quickly travel through multiple levels of your tags to find the right projects. All it takes is just a few clicks. In Pagico, everything can be connected. Attach a restaurant menu (file) to your travel itinerary (task), or simply connect a phone call action (task) to a contact — all it needs is just a few clicks. Even better, all inbound links and notes are collected and shown at the top of the container, so you'll never miss anything. Regular collections are like folders for your projects and contacts. But the Smart Collections are way cooler — you can find and group your stuff automatically based on criteria such as tags and keywords, and see all of them in one place. Keeping track of your @calls, @errands, or @bugs across your database cannot be easier. Turn web links into actions. 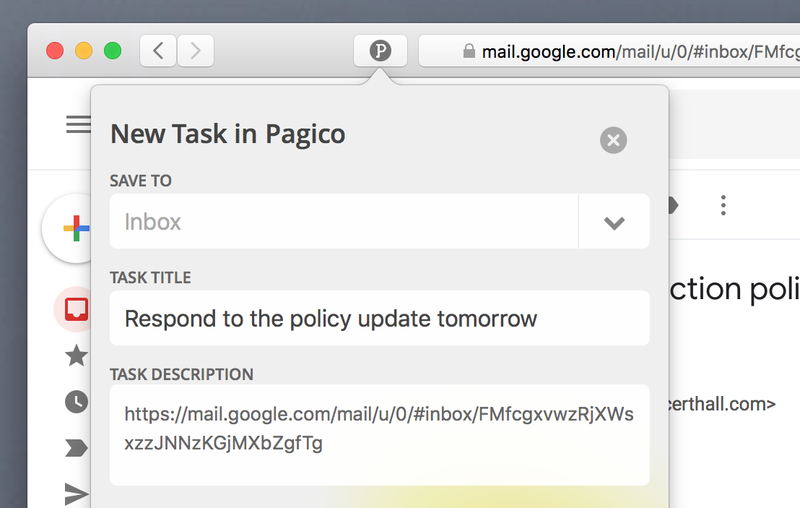 With the new Pagico browser extension for Safari, it's easier than ever to save web links or turn webpages into tasks. 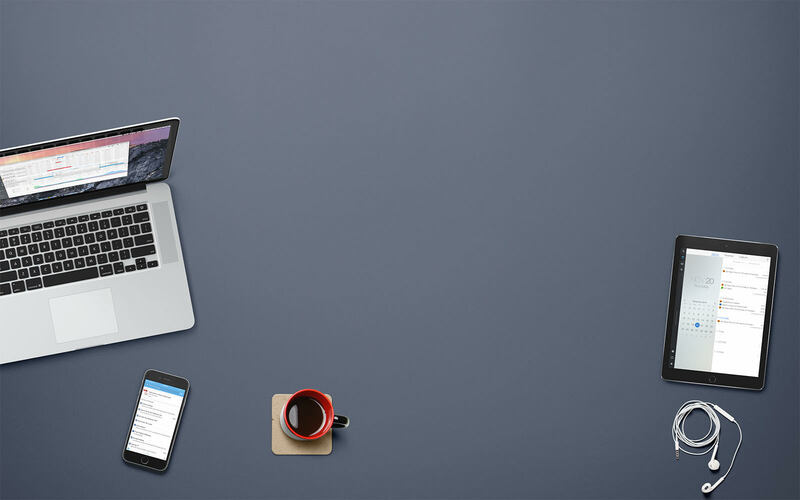 With a workspace, you can sync projects & contacts to your second computer, mobile devices (iOS or Android), or collaborate with your colleagues. Workspaces are like shared folders — Just put projects & contacts into it, and everyone in the same workspace will see them. Need to loop in someone who doesn't use Pagico? Just use the Public Share feature to let them see your project through their web browser. Pagico uses a secured SSL/TLS tunnel for data transmission, and a 256-bit AES encryption for your data stored on our servers. Your shared items will be stored on our servers for syncing purpose only. As soon as you unshare (or delete) an item, it is immediately removed from our servers. The Personal Sync (first 6 months free, then $10/year) is sufficient to sync projects & contacts among their devices. 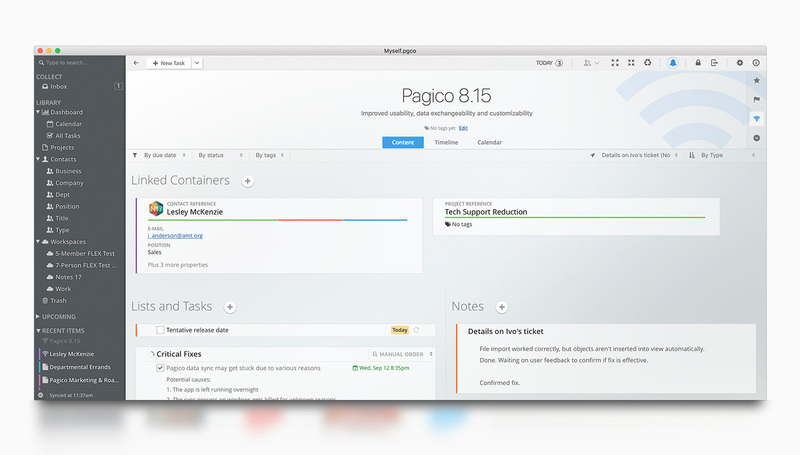 Pagico 8 further strengthens an original and superbly customisable task and project management app... it remains a productivity engine to be reckoned with. 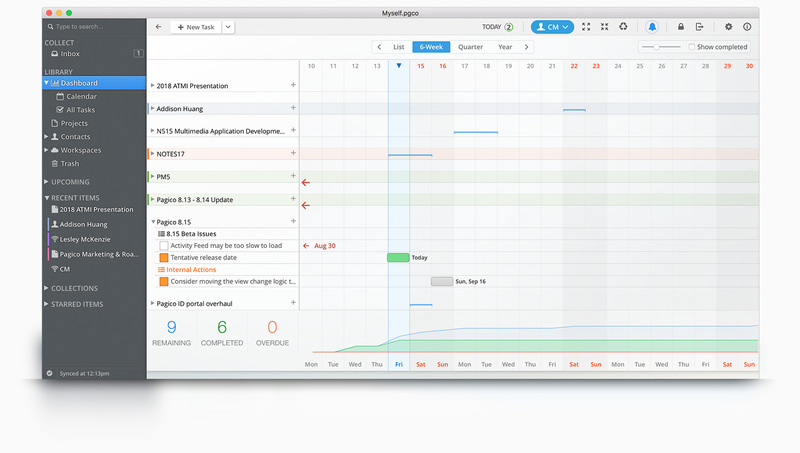 Pagico makes similar “be productive and stay organized” proclamations, but actually delivers on those promises in a way few Mac apps do. Pagico's strength is its ability to link objects, contacts and projects. The iOS apps are robust as well and I love having my data on the go. 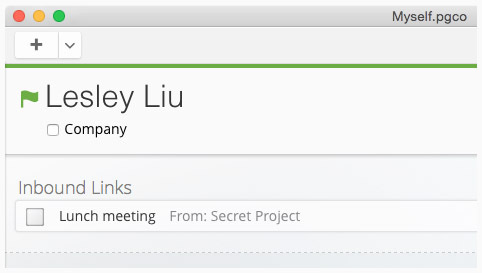 It does a great job at pulling everything together, no matter how scattered your tasks are between inbox and projects. It’s simple, and brilliant. Check out What's New in Pagico 8, the Getting Started Guide to get up-to-speed with Pagico in just a few minutes. Still have questions? Check out our Online Help section. Check out our blog or follow us on Twitter for development updates, release notes, and stories from us! Works great for teams, too! Organize all your projects and collaborate, right in one app.